Eating Disorder has a profound impact on all family members. Mothers and fathers, brothers and sisters are caught in the maelstrom that eating disorder almost inevitably creates. Families are thrown into shocked disarray by the discovery that their loved one has an Eating Disorder. For some it becomes an event of such deep significance that it completely and forever changes the family and its sense of itself. I spoke to a lady whose sister in law is suffering from Anorexia Nervosa. We decided to share this story on the blog to create awareness of how Eating Disorders place a heavy strain on the families and extended family members. If you have a family member or friend that has an eating disorder, you know first hand the stress and toll this takes on the entire family as well as close friends that care about them. We are all controlled by a 40 year old anorexic. Anorexia destroys families as much as it destroys individuals. It simply tears everyone apart. I married my husband and moved into my in-laws house in late 1990s. My sister in law only lived short distance away from us. She started dieting soon after the birth of her first son. I think she was engaged in a battle with an unseen force, where she had to competitively outwit herself to lose more and more weight. She would come back from her job exhausted and would curl up in a corner and go to sleep. Due to lack of energy, she had no time for her son or other activities. She left her son in the care of my mother in law. We were very happy to have him in our house, as he was the first grandchild of our family. My sister in law has one great love: her eating disorder. Dieting became an obsession in that her life became focused on losing more and more weight. The more we ignored her diets, the worst it got. The impulse to contain the problem within the family and resolve it without recourse to external help was very strong. My mother in law did consult our family GP but my sister in law refused to see anyone for her problems. I think sometimes we families make it possible for the sufferer to keep functioning in destructive behavior by not confronting the problem outright and in direct manner . At the age of 26, she was hospitalised for malnutrition. At that time Eating Disorder was completely unheard of, especially in our family. It was all put down to stress and over-work. She took a long break from work to get better, but it just made everything worst as she embarked on another rigid diet. Her quarrels with her husband increased. He was asked to monitor her eating, which was a very difficult thing to do. Soon it wasn’t just the diets that she was switching between, it was also severe moods and outbursts of anger. No one was spared from her anger. The ongoing push and pull between how to help, to what extent and in what ways created a great deal of stress among family members. The more she got into losing weight, the more time and effort she put into feeding her eating disorder addiction. Her life became a cycle: losing weight and trying new diet pills. Love of family–and time for family activities–took a distant second place to love of Eating Disorder. Eating Disorders and families don’t mix well. She was once again hospitalised for low weight and this time she was put on feeding tube. This time we shifted her to Priory for treatment. Eating Disorder Private costs to family are too great. There was a brief period of relief, as she started responding to therapy and started to look really well. She got down to a healthy weight and her relationship with her husband and family members also improved. She gave birth to a beautiful blue eye boy in 2000. We all were very happy. In 2001, me and my husband moved out of my in-laws house to a different city. We thought life was good and that everything was fine. Little did we know what was to come. She relapsed in 2002, but this time her Eating Disorder was more severe. She wasn’t just dieting but also using dangerous combination of pills to control her weight. She also changed as a person, soon her headscarf came off. She started to dress like a teenager. Her waist size had shrunk to the size of a 11 year old girl . If she wasn’t dieting, reading celebrity magazines, then she was busy shopping and she took great pride in shopping at kids shops. Her elder son became very distanced from both his parents while her youngest son clung to his father for love and comfort. I remember thinking we don’t have time for her behaviors and her moods. We nearly lost her to her anorexia In 2010. I felt sorry for the treatment team, who simply failed at breaking her out of her destructive cycle. Despite the ordeal of going through life support machine, she would not give up her obsession with dieting. In 2012, she left her husband and moved in with my mother in law. Now her new obsession is something that I am very ashamed of disclosing. She is still anorexic and I feel sick to my stomach when I look at her. What kind of world is she living in? And God helps anyone, if they say something that is offensive to her. We have to watch our words around her. My mother in law is subservient to her. She has no choice, she is completely helpless when it comes to reasoning with her. I’ve seen deterioration in her physical health, all due to stresses of living with her daughter’s eating problem. As a result of her eating disorder, we all have suffered enormously. Her elder son dropped out of college and is such an angry young man. I don’t know what more we could have done to help her. We are a highly academic and a high achieving family. We have tried all methods of recovery. What I don’t understand is how can losing weight take priority over your husband and your children? I really feel for families who are afflicted with this form of illness. 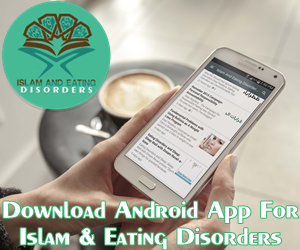 The impact of Eating Disorder on Muslim families has not been a area of key focus. Yet the diagnosis of Eating Disorder of a close family member creates enduring stress, anxiety and conflict that greatly affect the health and well-being of the family unit and its individual members.